Quieter and with fewer vibrations: this is how sand is to be extracted at Freihöls in the years to come. The concrete block specialist Godelmann based in the Upper Palatinate region of Germany had taken over the 29-hectare deposit, which was also known as the Amberg-Ost open mine, from Heidelberger Sand und Kies GmbH. In addition to this extraction area, the company acquired another 15 hectares of wooded land from two local farmers, making continuation of the extraction operations viable. The granted mining authority permission to extend the mine was transferred to Godelmann. Despite existing blasting permission, the company is switching to an environmentally friendly option. “The local residents are to be relieved of a burden,” explains entrepreneur Bernhard Godelmann. For a short time now, the operations in the sandpit have been using a Cat 352F L excavator with ripper tooth instead of explosives. The ripper tooth bores into the sandy ground and loosens the raw material. Then a 3.8-m³ digging bucket takes up the raw sand and loads it on a Cat 730C dumper truck. “The material is sometimes extremely hard,” says the managing director. The 52-tonne excavator brings 335 kN traction and a ripping force of 219 kN. Since 2015, the company has been producing its products in a CO2-neutral process: We have always produced environmentally consciously and in a resource-saving process, so the low-emission extraction process with the ripper tooth is a logical conclusion. Blasting is still permitted – but as long as extraction with the ripper tooth is possible, we shall stick with this method. Everyone needs raw materials. We want to extract them with minimum vibrations,” explains Bernhard Godelmann. Adaption of the extraction process certainly cost the company something. It required investments in the machine fleet, which was widened not only with the excavator, but also with a Cat CS66B compactor and a D6T LGP track-type tractor for work in mine filling and a Cat 972M XE wheel loader for loading. The construction machinery was supplied by Zeppelin‘s Erlangen branch. Besides pavers and patio tiles, the company produces masonry blocks and steps as well as special products including interior concrete fittings such as seating, washbasins or kitchen worktops. For all that, sand is needed as extracted in Freihöls. The new sand pit is worked exclusively for the company‘s own use. The face worked by the employees is around 20 m high. “For the next 30 years, we have assured part of our raw materials supply with the sand pit,” says the man from the Upper Palatinate. The material extracted with the ripper tooth is comminuted and sent to sand processing. 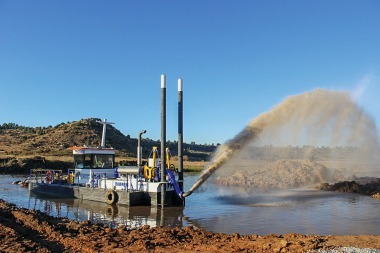 From the deposit, the sand is fed to a primary crusher for processing, to produce the sizes 0/0.5, 0/2 and larger than 2 mm. 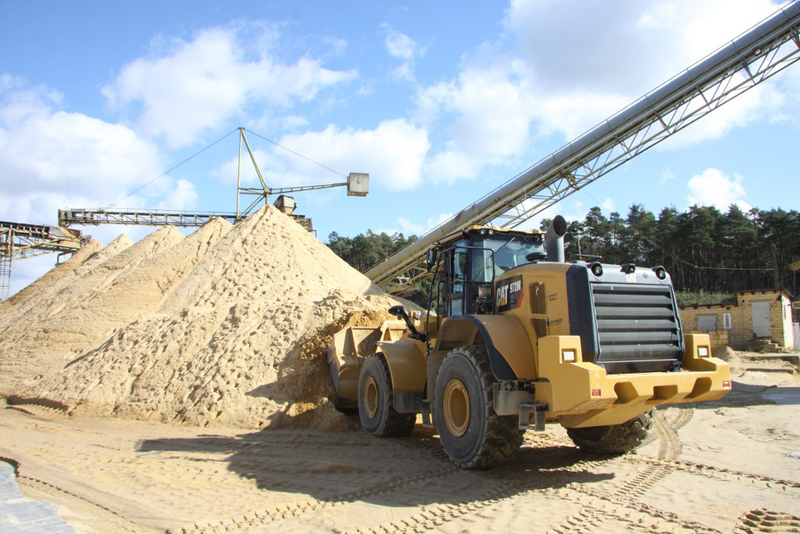 Negotiations are currently underway with suppliers of plant equipment, reports the manager, In 2020, a new plant for sand processing is set to go into operation. At present, the processing plant is fed every day with around 1000 t raw material. In two years, the feed quantity is to be doubled. The people working in sand extraction in the new pit should then achieve the extraction volume in a shorter period of time. Besides sand extraction, the employees also have to backfill the pit with the Z0 and Z1.1 material. Here Godelmann plans to use the Cat tractor and compactor. 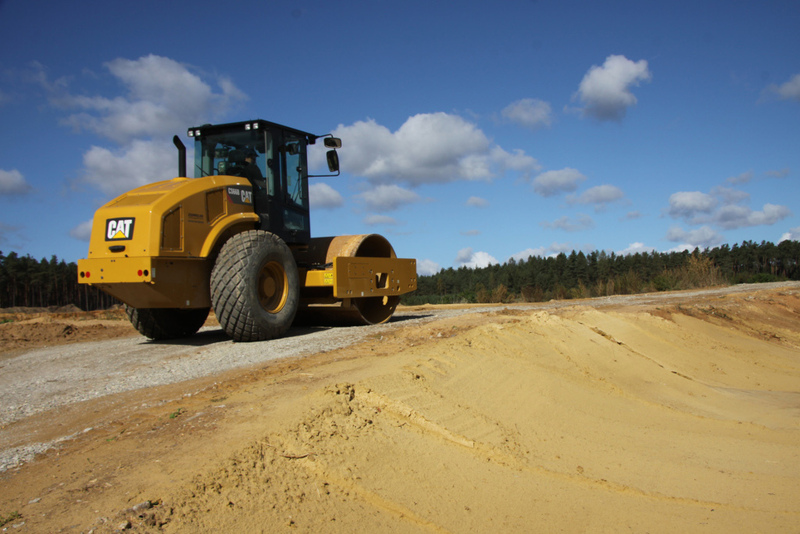 Assistance systems like Grade with Assist are to support the operator during shifting of material with automatic stabilization of the dozer shield and adjustment of its level and pitch to specifications. Moreover, the D6T LGP was fitted with a three-tooth ripper to loosen the soil. To compact the material in the mine, the compactor is equipped with a padfoot drum. In addition, a smooth drum was chosen for when the base courses are to be levelled.